I bought novel for my new iPad and read it on iPad. Can I now give it to my husband so he can read it on his Kindle? In other words, can I send it to his Kindle? I am guessing answer is no but want to find out for sure. After all, if I buy a book at the store of course I could give it to him when I’m done as well as lots of others. Thanks! Speaking of reading ebooks with your tablet, you may prefer Kindle to iPad. Kindle provides more comfortable reading experience to readers, and the price of Kindle is much cheaper than iPad. Many people who love reading choose Kindle to read the books they want, and the readers are able to get all kinds of books from Amazon. Kindle fully supports AZW, PDF, MOBI and PRC files, so it will provide more convenience for the readers in choosing ebooks. It is not convenient for iPad users to get ebooks on the Internet because iPad only supports EPUB and PDF files. If you are interested in reading books, you ought to give Kindle a try, and it will bring you wonderful reading experience. If you have saved a lot of ebooks in your iPad, you will want to transfer them to the Kindle in avoidance of purchasing them again. You will be able to transfer the PDF files from iPad to Kindle to read with ease, but if you want to read EPUB files on Kindle, you will need to follow the steps below. Before transferring books from iPad to Kindle, there is something you may need to know. Most of our purchased books from iBooks bookstore are forbidden to copy, transfer, and share. Apple put their own DRM (copy protection) on those books. So we cannot move books from iPad to kindle. Therefore, you could remove drm from your ibooks with Calibre if you are not allowed to transfer the books. 2. Books in iBooks are epub or pdf formats, not supported by kindle. All the books we bought from iBooks are epub format or pdf format, while Kindle devices only support Kindle’s own format, such as mobi, azw3, azw, azw4, prc. So even though we can copy our books from iPad to kindle, we still can’t read them on kindle, because we can’t find a right reading app to open them. And the guidance below will show you how to transfer books from iPad to kindle and read books on kindle with ease. 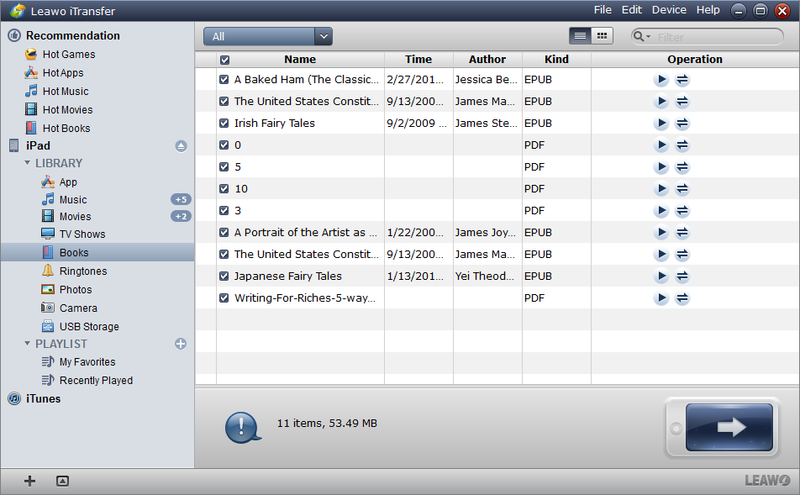 If you want to transfer books from iPad to Kindle, a piece of iPad transfer software will provide you much help. Leawo iTransfer is helpful on this issue. Leawo iTransfer is used for transferring files among iOS devices, iTunes and PCs, and it enables users to transfer apps, music, movies, TV shows, ringtones, ebooks, photos and Camera Roll without the sync of iTunes. 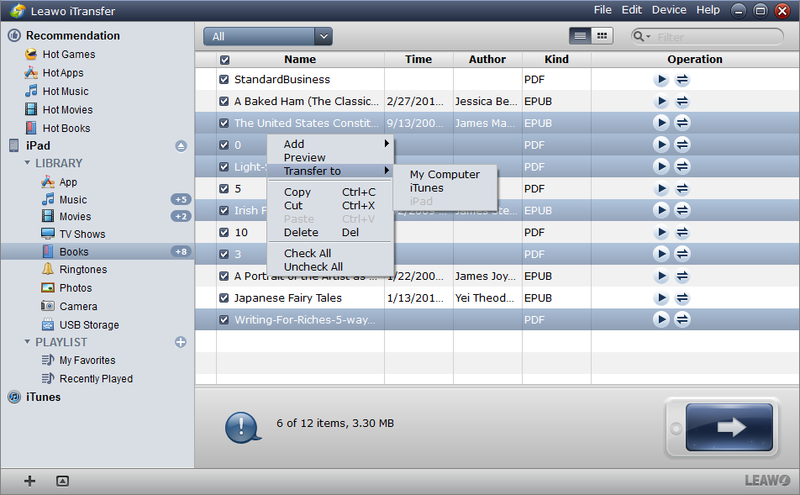 Leawo iTransfer helps to transfer PDF files to computer, and then the users can convert and send the files to Documents folder in Kindle by dragging and dropping on their computer. The following guidance will show you how to do it, and you are allowed to free download the software to have a try. Note that the trial version has limited transfer times. 1. Run Leawo iTransfer, and connect iPad and Kindle to computer with the USB cables. The software will automatically detect the libraries of your iPad, and then show the libraries in the left sidebar. Click “Books” and the contents will be shown in the right part of the window. 2. Click the transfer button at the right bottom of the window to transfer all the books from iPad to Kindle. Or hold “Ctrl” key to choose certain files and then right-click the chosen files to “Transfer to > My Computer”. 3. 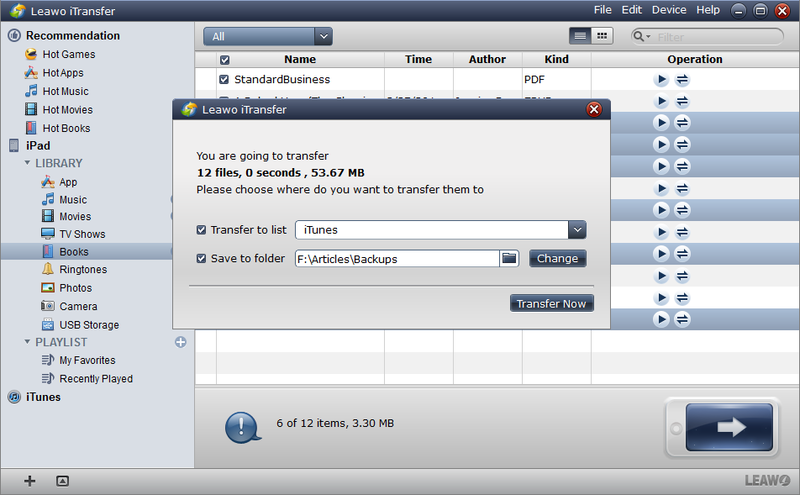 After choosing files, you will see the dialog of transfer settings. Check “Save to Folder” and click “Change” in the dialog to choose a folder on your computer to save the transferred books. Then click “Transfer Now” at the right bottom of the dialog to start transferring books from iPad to Kindle. 4. 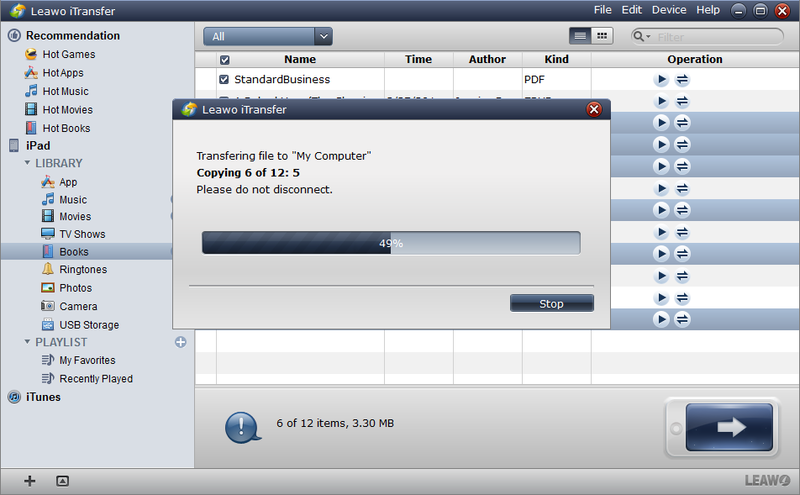 When the transfer is on the go, a progress bar will notice you the percentage of the transfer process. Leawo iTransfer will finish the transfer in short time, and when the transfer is done, you will get the books in the target folder. After that, you can convert the books to kindle formats and transfer them to the Documents folder in Kindle to have an enjoyment. Leawo iTransfer makes the data transfer of iOS devices easy to be done, and it is easy to use. Leawo iTransfer has simple-designed user interface which enables users to handle this software within seconds. This software also helps users to backup iPhone, iPad and iPod files to computer, for example, backing up iPhone apps to computer is easy to be done with Leawo iTransfer. If you are interested in this software, don’t hesitate to check it out.